To answer this question, NO. We to date have not had a home maliciously ruined from a renter or a group of renters. YES, we have seen some wear and tear and even damage from a renter that has caused us to think “What were they thinking?” but all in all new home owner’s imaginations are much worse than what actually happens. Do renters leave the home ‘s pretty dirty? Yes, but that is why they pay the cleaning fees. 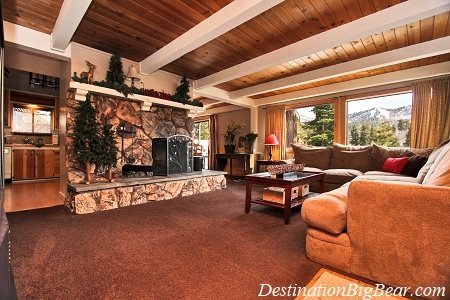 It is highly recommended to new Big Bear Lake Vacation Home Owners do not visit your home until your management company has cleaned it first 🙂 It could depress you. The worst thing that has ever happen to us is a child through a toy at his sibling and missed, it cracked the screen of the Flat Screen TV behind him. The renter called us immediately and wrote a check for the replacement. The TV was a Sony Flat screen that did not make the same model so the owner actually got a 1080 replacement instead of a 720. 99% of the people are good responsible friends or families looking for a weekend away from the city. We have found that problems can appear when the friends of the friends somehow get invited. Big Bear Cabin Rentals do experience wear and tear but it is very very rare to see actual damage. What do expect? As mentioned above, homes can be left pretty dirty! Carpet will get smudges, Walls about waste level will get black marks on the wall from bags, near the floor in doorways chips on the trim will occur from people pulling suitcases with wheels on them. Kitchen chairs get loose, kitchen cabinet doors get loose. Bathroom toilet paper holder and towel holder if not drilled into a stud most likely will come out. Even anchored accessories will come out. Window Coverings (rods) – If they are not anchored will come out. Blinds just are terrible and the strings always get tangled. Futons, Pull out couches and Recliners do not hold up well in rentals. Outdoor furniture and grills – Glass tables can easily break in the mornings during the winters. The glass is drastically changing temperatures from overnight lows to now with temps up to 50 with the sun on it. Our glass experts tell us this is very common. Grills if not bolted down can cause damage to nearby windows, home siding, railings, etc. Tenants will move grills around and if they get too close to something they can burn it. Be mindful where you place your grill and try bolting it down to the deck or the home. Do not leave personal items in the your home if they are not replaceable. Every home is different and we have seen homes go 2 or 3 years with not one single issue than there are other homes that during the first year a great deal of small issues occur as mentioned above. If a home has been a 2nd home for 15 years and is only used 6 times a year that is 90 uses with maybe 8 people in it. That is 720 people using a home in 15 years. Now compare that to renting the home to 12 people 80 times in one year. That is 960 bodies in the home in one year. These 960 bodies do not know where items are and will open kitchen cabinets, drawers more often than the past owners have in 15 years looking for items. They are not 100% sure how to operate futons, pull out couches, blinds, recliners, etc. If a home owner was to take notes regarding all small maintenance items they have done over 15 years and then compare that to what may or may not occur in 1 year of renting it would be a more realistic view of the affects of renting. One more thing, Plumbing. It does get cold in Big Bear sometimes below freezing and if you have an old home that generally the water is shut off when you are not using it, it is still possible for the pipes to freeze while a tenant is using the home even though it is heated inside. We have seen this on more than a few occasions where the tenants go to bed with water and wake up with no water. This is only happens to older homes that have pipes that are not insulated under the home or even at the Stop and Waste valve outside. Have we scared you yet 🙂 We are not trying to, we have just found this business is about managing expectations.